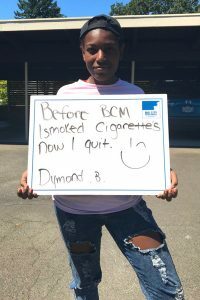 We are so proud of Dymond and her newly accomplished goal to quit smoking! On a BCM trip, the important life skill of goal-setting is a key part of the curriculum. Every morning in the backcountry, the group members circle around their map, discuss their options, and determine their goal for the day (e.g., reach a specific camping spot). After they embark on their journey, they learn to encourage one another toward the goal, track progress toward it, and re-evaluate when necessary. Along with the group goal, each student also takes on individual responsibilities with specific goals. These include roles such as Navigator, Cook, and Water Master. The team depends on every person to fulfill their role, otherwise they risk not accomplishing their group goal. As with all BCM trips, the purpose is to transfer knowledge learned in the field to life back home. Our aim is for students to be capable of identifying relevant and attainable goals on their own, and have the confidence to take action toward the goals. After her expedition, Dymond had the confidence to set a lofty goal and the determination to achieve it. Keep it up Dymond, we believe in you! Want to give more teens the opportunity to learn critical life skills on a BCM trip? Learn more and donate here.